“The people of Aleppo have a shared passion. Not only do they pride themselves in food that is steeped in culinary traditions and guard their recipes close to heart, they undeniably affirm their cuisine as the best in the Middle East. As one of the world’s oldest inhabited cities, Aleppo’s cuisine takes inspiration from the mosaic of cultures that have inhabited Syria over the millennia, as well as more recent influences of the Ottomans and Armenians. 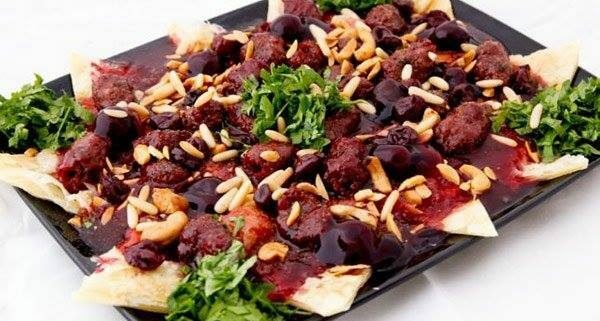 Lightly smoky, spiced beef meatballs in a sweet & sour sauce made from sour cherries, garnished with parsley and pine nuts, and served over triangles of fresh pita bread. A delicious dish of fresh broad beans sauteed in olive oil with garlic and coriander (and a touch of sugar, which helps preserve the lovely pale green colour of the beans), with colourful radishes & pickles, and fresh pita bread.